The very name of Merlin conjures up images of magic and mystery. Perhaps even more than King Arthur, the real character and person of Merlin remains obscure, lost in centuries of tales told and retold. The Merlin of legend is at once a master of enchantments, a prophet and a kingmaker. To understand the real Merlin, however, it is necessary to forget our modern conception of wizards and magicians, derived from Shakespeare’s Prospero, Tolkien’s Gandalf and T H White’s amiable but bumbling Merlin. These are recent inventions. If it is accepted that Merlin lived in the age of King Arthur (i.e. in the fifth or sixth century), he would have been a combination of a priest and a witch doctor, more akin to a shaman or druid than a wizard as such. There appear to be two contesting theories about the origin of Merlin: firstly that he was a composite of several different individuals and secondly that there was only one real Merlin, who was actually called Myrddin Emrys, and that he was a Welsh bard and soothsayer who died in the sixth century. We first hear about Merlin in a book entitled A History of the Kings of Britain, written around 1135 by a Welsh bishop named Geoffrey of Monmouth. Merlin’s birth was the subject of a strange story. Apparently, the Britons were told that a great fortress they had built on Salisbury Plain, possibly near Stone Henge, would never be safe until the ground there had been soaked by the blood of a child who had no mortal father. Such a half-human sacrifice seemed impossible to achieve, until it was learned that a beautiful girl was supposedly about to give birth to the child of a demon. The child turned out to be Merlin, who possessed fabulous powers inherited from his unearthly father, who might have been a demon, a fairy or a god. Merlin in the end did not need to be sacrificed for the sake of the fortress because he was able to deal with the problem by means of his powerful magic. This story sits strangely with Monmouth’s later account of Merlin’s assistance to King Arthur, whose father Uther Pendragon was said to have invaded Britain successfully a century after the time of Vortigern. Merlin sided with Uther and employed his powers to enable him to sleep with Igraine, the wife of a Cornish nobleman, by disguising him as her husband. Due to his deception Arthur was conceived. Once he ascended the throne, King Arthur had Merlin as his trusted advisor and often used the wizard as a messenger because, it was said, he could assume any shape he pleased. Whilst Geoffrey of Monmouth tried to reconcile the two stories with the explanation that Merlin lived to a phenomenally old age, scholars have put forward a variety of other explanations. In her book Merlin, the American professor Norma Lorre Goodrich argues convincingly that ‘Merlin’ was a title rather than a name (a merlin is a type of hawk) and that the original Merlin was a bishop named Dubricius, who crowned King Arthur. The alternative view put forward by Nicolai Tolstoy in The Quest for Merlin, which was published at around the same time as Professor Goodrich’s book, was that Merlin was based on a real Welsh bard named Myrddin, who was alive after 573 AD. He speculated that Geoffrey of Monmouth changed Myrddin to Merlin because merde in French means ‘faeces’, and a magician named Myrddin would have invited ridicule in an age when England was ruled by the French. Myrddin was a ‘Wild Man of the Woods’, a poet who went mad, lived in the wilderness and achieved certain magical powers. This conception of Merlin is perhaps more consistent with the idea of him being a druid or shaman closely in touch with nature and possessed of supernatural powers, rather than simply a king’s counsellor. The traditional role of tribal witch doctors and shamans was as intermediaries between human beings and the spirit world, and their chief function was to ensure good hunting or bountiful harvests. Celtic druids belonged to the same tradition. Druidism was a form of nature worship that came to Britain around 600 BC with the Celts, but many older forms of shamanism had existed long before that: Stone Henge, for example, was a temple for nature worship and is precisely aligned to the stars. Nicolai Tolstoy (who is, incidentally, related to the author of War and Peace) was convinced that Merlin was the last of the druids. Druidism was driven into Wales with the Celts and survived there long after Christianity had stamped it out in the rest of the British Isles. Tolstoy pointed out that the Myrddin stories are full of clues that link the magician with druidism: he invoked sacred apple trees, had wolves as familiars and took on many of the characteristics of the horned god of pagan mythology. Myrddin even met a pagan ‘threefold death’, being clubbed, speared and drowned. Professor Goodrich preferred the traditional story of Merlin’s end in which the great wizard became enamoured of a maiden named Vivian or Nimue, the Lady of the Lake, to whom he offered to teach magic. The fey enchantress finally uses one of Merlin’s own spells to bind him and entomb him in a cave under an enormous rock. The Lady of the Lake is sometimes equated with the Christian Saint Nimue and it is argued that the story of her final triumph over Merlin is really symbolic of the triumph of Christianity over paganism. Like everything about the life and death of Merlin, the subject has been debated endlessly and, as with King Arthur, it is almost impossible to come to any final resolution. Both were men of such remarkable stature that, even within a few decades of their deaths, they became the subject of myths and legends which have blurred the reality. Perhaps the only thing that can be said with some semblance of certainty is that Merlin (or Myrddin) must surely have existed in one form or another given the enduring and compelling nature of the myths behind the man. This is a very enjoyable post. I’d have to agree with the arguement that Merlin was a druid not a magician or wizard. 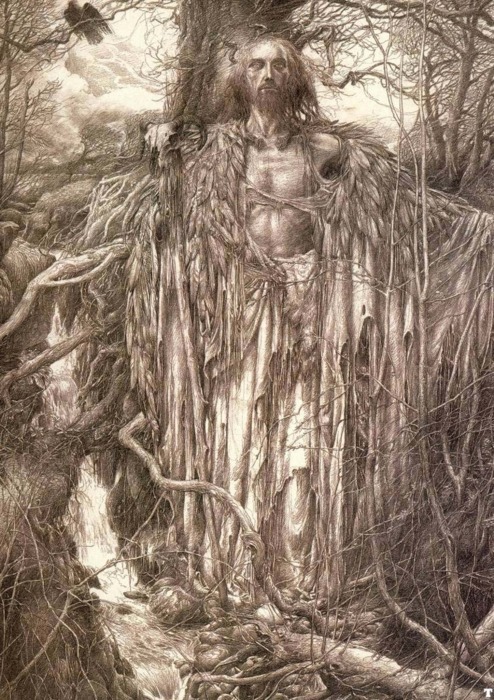 It’s interesting to think of him as the last true druid, one who truly was in touch with the power of Mother Nature. Really interesting post (I like how you write things with enough specificity to inform but enough vagueness to keep me interested). I never thought of Merlin as a figure of paganism, with The Lady of the Lake as a Christian element. It’d be interesting to see the evolution of the tale as time passed, what elements have consciously changed. Intriguing! I live near Stone Henge, and I’ve always liked the story about Merlin magicking its stones over from Ireland (which I’ve only just realised is from Geoffrey of Monmouth too). I’d be very interested to read ‘A History of the Kings of Britain’ — Lear appears in it, am I right? I’ve always been interested in history, especially medieval and each time I’ve studied history, a figure always projects it’s self out. The King Arthur and Merlin histories. With the amount of historical figures, Merlin, King Arthur and the Knights have always caught my attention. I’m just intrigued and I do think Merlin existed, but back in those days people were scared easily when it came to different beliefs and Merlin coming from being a druid or celtic was seen as a wizard. I’ve always wanted to visit stone henge and other historic places of Merlin.